Since I started geocaching it has become one of my favourite pastimes, combining tech and outdoors, consequently I talk about it a lot. To see my general posts about geocaching click on the Category in the sidebar. I am working on a quick and dirty way to post new logs from my pocket queries to a seperate blog so look out for that soon. 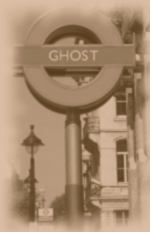 If you know of a Ghost Station in your area and want to add to this series then feel free to use the images on the cache page and ping me a message to add it to the Bookmark series. We completed the 100 a few weekends ago (102 caches to be exact) with a few left over to go back and find. We managed it in 48 hours, so whilst not worthy of the wall of fame, impressive feat on foot if I do say so myself. It was a fun series in all with many highs and lows: hides, paths and moods. Plugged in the codes this morning and got the coords, so we were ready and since I'll business travelling next month we decided this was our last shot to go for it before the end of summer (or is already over?). Headed out late, 5pm and found a place to park in a close just off the main road North of the cache. Headed down into the field and surroundings looked familiar. We got to the end of the field and then it seemed that we'd taken the wrong shortcut. Climbed the farmers gate, only to later realise there was a stile nearby in the corner of the field. Cache was not difficult to reach but surrounded by nettles and brambles which were hostile to my pale bare legs (knew I shouldn't have wore my shorts). Glad we did not have to walk far for this one (well, actually we did but you know what I mean). Quick photo op at GZ, admire the tat that is left after all the goodies have been pillaged and we were on our way back to the car. On the way back I remarked to the wife we should go by No. 50 and see if we could try again... so we did. Thanks for a great series, which is obviously heck to maintain, but we didn't mind helping out. Now just to sweep up those one's that eluded us! This entry was edited by _TeamFitz_ on Monday, 30 August 2010 at 13:01:48. On the way over, I got an email alert for smithcox's find, so I felt certain this would be no trouble. Of course, this gave us as much trouble as it had in the dark with torches - 45 minutes later we were frustrated and still cacheless. We'd searched all the spots we had before, including some obvious and some not so obvious places. We knew from previous logs that we should be looking up but all the climbing and poking yielded no fruit. I looked at smithcox's log again and even though we found something tool-like hanging off a branch, there wasn't a way we could see that it would prove useful for what we intended and in the end it was a red herring. We were about to give up (how many times does a geocacher say this in their log eh?) and then Mrs Fitz found something else which could be described as a tool but not something we'd call a tool, but using it and with a bit of help from me, Mrs Fitz was able to try something and.... yes..... it was a cache after all! Kicking ourselves for this one as we've done so many now. I had looked at this on the first attempt but I also spotted the huge spiders nearby and decided that it just couldn't be. Well, it was. TFTC! Coords in the description were confusing and seemed to be wildly out, took a reading ourselves, if it's any help to others. The hint is confusing only if you don't know what you're looking for. This entry was edited by _TeamFitz_ on Monday, 30 August 2010 at 13:08:25. This entry was edited by _TeamFitz_ on Monday, 30 August 2010 at 13:09:08. Finally found this with Geocritter (my nephew, doesn't have an account) and my non-caching brother! We DNF'd on this one a long while ago so I emailed HH to check the coords, he advised we were one digit out on the Westings, however the irony is that I realise we had found the correct GZ before, but the number I sent to HH was wrong. So after checking all along this bank we even went to up to the top of the bridge wondering if it was hid there but no. After looking over previous logs, read a couple of things which gave me us a bit more direction. Headed back to to GZ and this time looked in the less obvious place, after routing around and putting my hand here and there, I finally spotted the thing which was right in front of my face, but had not noticed! At least Geocritter managed to dodge all the dog****, me and my bro were not so lucky. Geocritter's 4th cache, really loves geocaching and perhaps I'll open a separate account for him soon but he's just a bit young yet to be let run riot on the internets. Thanks Hillhappy for another excellent cache! This entry was edited by _TeamFitz_ on Sunday, 29 August 2010 at 16:28:24. Actually "found" on 17/8 but just got to logging today (30/8) having time to do research. After Going Out Or Getting Lost If Not Good answers, found an obscure blog or two, and those led me onto some of the key scientific and trade descriptions. I think I have the correct answers but prepared to accept if I got them wrong - I particularly found the stone masons term of reference difficult to obtain but I think I understand it. Anyway, I went for this one on my way back from the Saudi Arabian Embassy, after submitting my application for a visa to go there for business. It was grey day which turned a bit wet and I had spent an hour waiting for the embassy to open that morning (open one hour later due to Ramadan). Took a while to locate as I was using solely my Android phone which got me to within 30m of GZ but a quick gaze through the previous logs confirmed my location. Learned something new again thanks to Geocaching, and got to see the HQ of that paragon (arguably) of financial reporting. Much more satisfying than a couple of Gowalla check-ins! Won't let me upload an image just now (down for maintenance)... will upload asap. We were in the area doing cache maintenance in Cassiobury Park so decided to hit this one whilst we were here. Mrs Fitz found it after we tried the wrong side of the fence, she found a hole she could fit through and disappeared as I walked ahead. Nice large sized container but I hope it survives the winter - maybe a lock n' lock would do here. Nice walk and a lovely view in the late evening sun, pretty sure this is a wheat field though? Final one of the day for us and WCC Crew were impressed with the larger size. Now back to Watford with a sore hiney - must really get a new bicycle seat as the standard one on this is hard, with no suspension! Thanks for another enjoyable series GUM54! Seems like the council/highway authorities wanted to cover all bases for walkers, The top of this post has arrows pointing all ways! Will upload a photo later when I get the chance to examine my SD card. Another one found by TeamNoodle whilst I had walked past it without a thought. Nice view from here, good view of the M25 and it's STILL a car park on the Northbound! These were getting easier to find now, saw something that was a bit out of place and there the cache was. TeamNoodle found this one whilst we were all looking around the gate. Nice spot and the rain was petering out.